This article is about David Wells, the American baseball player. For other uses, see David Wells (disambiguation). "Boomer Wells" redirects here. For the first baseman, see Greg Wells (baseball). Wells was born in Torrance, California. He grew up in the San Diego neighborhood of Ocean Beach and attended local public schools. He graduated from Point Loma High School in 1982. He was a self-described "gym rat" who spent most of his time at the Ocean Beach Recreation Center and Robb Field. Baseball facilities at both Point Loma High School and Dana Middle School are named for him. He lives in San Diego with his wife and two sons. He has a tattoo of Babe Ruth. Wells debuted for the Toronto Blue Jays in 1987 as a reliever and did not secure a job as a full-time starter until he was 30 years old. During his six seasons with the Blue Jays, Wells compiled a 47-46 record and a 3.88 ERA altogether. Wells was part of the 1992 World Series winning team, the first time he got a championship ring. He was released by the Blue Jays during spring training in 1993. Shortly after he was released by the Blue Jays, Wells signed for the Detroit Tigers. He emerged as a top-flight pitcher in 1995, when he was 32. After starting the year at 10-3 for the struggling last-place Tigers, Wells made his first All-Star Game appearance. Wells had a 26-19 record and a 3.73 ERA during his tenure with the Tigers. Wells was traded to the Cincinnati Reds for C. J. Nitkowski, Mark Lewis, and minor leaguer Dave Tuttle. He finished the rest of the 1995 season with a 6-5 record and a 3.59 ERA. At the end of the season he was traded to the Baltimore Orioles for Curtis Goodwin and minor leaguer Trovin Valdez. In 1996, he pitched then-career high 224 innings but finished with an 11–14 record and a 5.14 ERA. In 1997, Wells signed as a free agent with the New York Yankees, his favorite team because of a lifelong interest in baseball legend Babe Ruth. He asked for uniform number 3, Ruth's long-retired number, and was of course denied. He ended up taking 33 for the Yankees. On June 28, 1997, Wells took the mound wearing an authentic 1934 Babe Ruth hat, which he had bought for $35,000. Manager Joe Torre made Wells take it off after the first inning because it didn't conform to uniform standards. Wells then blew a 3–0 lead as the Cleveland Indians won 12–8. After posting a 16-10 mark in 1997, Wells pitched very well in the Yankees' record-setting 1998 season. He rang up an 18-4 record, finished fifth in the league in ERA (3.49) and was third in voting for the Cy Young Award. On May 17, 1998, Wells pitched the 15th perfect game in baseball history, when he blanked the Minnesota Twins, 4–0. Wells attended the same San Diego high school, Point Loma High School, as Don Larsen, whose perfect game for the Yankees in the 1956 World Series was the only perfect game or no-hitter ever thrown in postseason play until 2010, and was until then the only perfect game thrown by a Yankee. David Cone would add a third Yankee perfect game in 1999. Wells claimed that he threw the perfect game while being hung over. On September 1, 1998, Wells came fairly close to recording a second perfect game. Pitching against the Oakland Athletics, he allowed no walks and only two hits, the first of which came with two outs in the seventh inning when Jason Giambi fought off an 0-2 count and singled. After the season, Wells returned to the Blue Jays as part of a trade for Roger Clemens, along with Homer Bush and Graeme Lloyd. He continued to win north of the border, with records of 17–10 and 20–8 over the next two years. Wells along with fellow pitcher Matt DeWitt were traded to the Chicago White Sox, in a deal that was quickly mired in controversy. The primary player being traded by the White Sox, starting pitcher Mike Sirotka, was injured at the time of the deal, and he never pitched in the major leagues again. Toronto's general manager, Gord Ash, had not made the deal contingent on the results of a medical examination, however, and MLB ruled in favor of the White Sox. The Blue Jays thus received only Kevin Beirne, Brian Simmons, and minor leaguer Mike Williams, and the mistake ultimately cost Ash his job. The deal did not turn out particularly well for the White Sox, either, as Wells struggled with back problems in 2001 and pitched only 100⅔ innings. Wells went 5-7 with a 4.47 ERA during his year with the White Sox. After a short season with the White Sox, Wells returned to the Yankees, a deal that was again immersed in controversy as he had already reached an oral agreement to join the Arizona Diamondbacks. Despite having lost some velocity from his fastball, he retained his excellent curveball and his control, and posted an outstanding 19–7 record in 2002. Wells was the subject of some controversy prior to the 2003 season, when his autobiography Perfect I'm Not: Boomer on Beer, Brawls, Backaches and Baseball, was published. The book upset the Yankees' management, and Wells was fined $100,000 by the team for disparaging comments which appeared in it. One of them included himself having a hangover when he pitched his perfect game. Among the other controversial statements were claims that he strengthened his pitching arm as a youth by throwing rocks at homeless people and that his minor league team, the Kinston Blue Jays, had segregated stands in 1983 despite ample evidence to the contrary. Amusingly, Wells claimed to have been misquoted in the book, which was presumably penned by a ghost writer. The problems didn't carry over to the field, however. Wells posted a 15–7 record and helped the Yankees win another pennant. On September 28, 2003, the final day of the regular season, Wells earned the 200th win of his career in a game managed by Clemens, who had won his 300th game earlier in the season and was thought to be retiring from baseball (Clemens ended up delaying his retirement). Regular Yankees manager Joe Torre let Clemens manage the final game of the regular season, and Clemens pulled Wells from the game in the eighth inning. He was also criticized by Yankee fans for not being able to pitch during Game 5 of the 2003 World Series. He started the game, but left during the first inning because of a bad backache, which caused Torre to use his bullpen to finish the game. The Yankees ended up losing the game and the series to the Florida Marlins in six games. On January 1, 2004, Wells was signed as a free agent by the San Diego Padres to a one-year contract. Wells posted a 12–8 record with a 3.73 ERA to start off his second stint in the National League. On December 11, 2004, Wells signed a two-year deal with the Boston Red Sox and took the uniform number 3, in honor of Babe Ruth. Getting off to a bad start, many fans questioned the decision of general manager Theo Epstein, but after coming off of the DL and getting rocked in his first start back in Oakland — and changing his uniform number from 3 to 16 – David Wells became the same dominating pitcher he was in the past. He went on to post a 15-7 record, with a 4.45 ERA. Wells pitched much better than his ERA may show, but had a few very poor outings, which caused his ERA to "balloon." 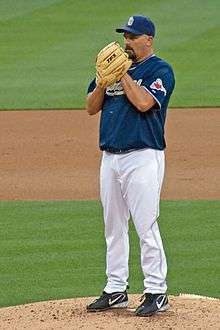 After the 2005 season, Wells requested a trade back to the West Coast, but he eventually withdrew that request and resigned himself to one last year pitching for the Red Sox. Wells began the 2006 season on the disabled list, as he was still recovering from surgery performed on his right knee. After pitching one game on April 12, he was again placed on the 15-day disabled list. He announced that if his knee did not improve he would retire. Wells came off the disabled list on May 26, to make his second start of the year against the Tampa Bay Devil Rays. On August 31, 2006, with the Red Sox postseason chances fading, Wells' wish of finishing his career playing for a West Coast team and a playoff contender was granted when he was traded back to the Padres for top catching prospect George Kottaras. Following the 2006 season, Wells filed for free agency. For players who are already planning on retiring, this is a customary move in case one changes his mind. Wells' agent had stated the pitcher will keep his options open but his physical condition will play a large part in making the final decision whether or not to return for another season. Eventually, Wells decided to stay with the Padres, agreeing in principle on a one-year deal worth $3 million in base salary with a possible $4 million more in incentives. On March 18, 2007, the media revealed that Wells has been diagnosed with Type 2 diabetes. This form of diabetes is more closely associated with lifestyle factors, such as diet, but the condition of people with a genetic disposition for diabetes can be exacerbated with chronic high blood sugar, as insulin resistance can be an adaptation of insulin in the wake of too-high blood sugar over time. On August 8, the Padres announced they would cut ties with Wells when Chris Young was ready to come off the disabled list. On August 23, 2007, Wells was signed by the Los Angeles Dodgers. His first start with the Dodgers was on August 26 against the New York Mets. He pitched five innings and allowed two earned runs. Wells also reached first base on a bunt single, scored a run, and earned the victory. He was the oldest pitcher to start a game for the Los Angeles Dodgers. On September 13, 2007, against his former team, the San Diego Padres, Wells had his first multi-hit game of his 21-year career at the age of 44. He hit a single and a double off former teammate Greg Maddux. Wells finished the season with the Dodgers going 4-1 with a 5.12 ERA. Wells filed for free agency after the 2007 season. On August 2, 2008, Wells took part in the 62nd Annual Old Timers Day at Yankee Stadium, where he said that he was not going to officially retire, but admitted that his pitching career was probably over. Beginning in 2009, Wells began working for MLB on TBS doing regular & post-season coverage. In 2011, Wells became host of The Cheap Seats on FOXSports.com. In 2010, David Wells was interviewed by Jane Mitchell for the television show One on One. In addition to David's story in his own words, the interview featured Kevin Towers, Trevor Hoffman, Josh Barfield, Chris Young, Mariano Rivera, Derek Jeter, Clay Hensley, family, and friends, all sharing their personal experiences and thoughts about David. Wells served as a baseball assistant coach at his alma mater Point Loma High School for several years. The high school announced on June 17, 2014 that Wells will be the head baseball coach there, starting with the 2014–2015 school year. The team's home field was named David Wells Field in 2010.> In 2014 David Wells field went through a two-million-dollar renovation which was underwritten by the San Diego Unified School District and David Wells. ↑ Mark Feinsand (March 1, 2003). "Book 'em, David: Wells explains". MLB.com. Retrieved October 2, 2009. ↑ Rubin, Adam (January 11, 2002). "With Wells, Boss Beefs Up Rotation Deal Over Burgers". Daily News. 1 2 Curry, Jack (March 10, 2003). "BASEBALL; Yankees And Wells Hope Fine Ends Story". The New York Times. 1 2 Baxter, Kevin (August 31, 2007). "The Big Easy". Los Angeles Times. ↑ ESPN.com – MLB – Padres' Wells has diabetes but vows to 'beat it' It was later reported on May 5, 2007, that Wells' diabetes were likely a result of his morbid obesity. ↑ Mitchell, Jane (2010). "One on One – My Journey with Hall of Famers, Fan Favorites and Rising Stars". Retrieved from http://www.JaneMitchellOneOnOne.com. ↑ Hopkins, Scott (June 19, 2014). "MLB All-Star David Wells to helm PLHS baseball". Peninsula Beacon. ↑ Culver, Heather. "Ex-MLB Player David "Boomer" Wells Dedicates Namesake Baseball Field". NBC San Diego. Retrieved 19 January 2015. 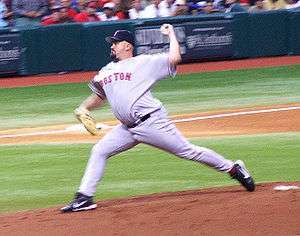 Wikimedia Commons has media related to David Wells.